One reaction to Microsoft’s announcement of Office 2010 which we find amusing (or whatever the term that is appropriate in discussing one’s own obituary) is “This spells the end of Zoho.” What most people fail to realize is that while the online Office suite is certainly an important part of Zoho, we have in fact a portfolio offering which now includes over 20 different business, collaboration and productivity applications. But if there’s anything I’ve learned from my years in the tech world is that companies don’t get killed by competition, they usually find creative ways to commit suicide. Office 2010 will be the end of Zoho, if we stop innovating, stop being nimble and flexible in our business model. Then again, if we stop all that, Zoho will die anyway, no Office 2010 needed to do the job. There are numerous examples in the technology industry to illustrate this. Consider two companies of similar vintage, both of whom faced Microsoft: Borland and Intuit. Which company has done better? Does that have to do with their competition with Microsoft or their own ability to innovate and adapt? Having under 350 people in Zoho gives us a natural flexibility in evolving our business model. For starters, we are the easiest company for partners, large and small, to work with and many times part of the value we bring to some other prospective companies is exactly that we are not Microsoft nor Google. Those partnerships mean real paying customers and revenue, which means Zoho has the economic vitality to keep innovating. Second, there is a reason Zoho provides a broad suite of applications – there are applications like CRM, Projects, Creator, Meeting, People, Invoice and so on that face a different competitive landscape, allowing us to thrive even as we face the most formidable software company on the planet. Finally, it is a common mistake to assume that business models that worked well in the past will continue to work well in the future, even as the technology landscape changes. 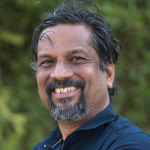 A company like Zoho has a lot more strategic flexibility than Microsoft has – not having to protect a $16 billion high-margin revenue stream is one important reason. What all that means is that while there is no risk of Zoho killing Microsoft anytime soon (! ), we are also confident we won’t die because of Microsoft. In much the same way we don’t view Google as the mortal enemy, we don’t view Microsoft as the mortal enemy. We do not view competition in moral good vs evil terms. To be sure, there are important moral questions – my favorite one is what the Federal Reserve is doing to our money, an important moral question, with profound implications for society, though not one normally seen that way – but there are no profound moral implications in which word processor you use to compose that love letter or even that annual report, that’s for sure. When competitors fight, customers win, that is all there is to it. In any event, hating competitors is a good way to lose objectivity and lose focus on customers. That is why we embrace Google-promoted standards and technologies, but we also support a wide variety of Microsoft products in the Zoho suite, including the Zoho plug-in for MS Office. Indeed, with the Zoho plug-in, you can get a most of the collaborative features promised for Office 2010 even in Office 2003. When we embrace such technologies, all we ask are: Will this help customers? Will it provide so much value to them that they want to pay for it? We have been in business for over 13 years now, and at numerous times, facing “mortal” challenges on numerous occasions – in fact, I remember a conversation in 1997 when a prospective partner told us “I don’t see how you are going to survive against X”. Not only did we survive X (no we didn’t survive by “killing” X, they are also around! ), but we actually did well enough to gain capital and experience to build more software, enough to have arrived at “I don’t see how you are going to survive against Microsoft.” May be we really should worry when people stop asking that “survival” question, because that’s when we get complacent. I just finished reading this post coming from the another post of @Joel in Buffer (https://open.buffer.com/joel-questions/). I finished reading and then looked at the date, how awesome blog from 2009! You absolutely survived in the competition between you and Microsoft! Great job! It’s sad to see that somes companies are going to die because of bad technologic choices. It’s even worse when you know them personnaly and even worser when you work inside these companies. Having worked for many companies and now running my own company I have fortunately and unfortunately seen many companies kill themselves with an isolated view. This can be that they either see their company as being bullet proof, they focus on what management feels is best as opposed to listening to customers and employees on the front line. This is a relatively quick death. There are also those companies which reach a certain point and are happy there. This is a usually a long slow death.My closing piece of advice is if a business is not in it for the long run, sell before you are worthless. Completely agree with the title. It boils down to ‘survival of the fittest’. The consumers are always discerning and they will let one who is good both pricewise and qualitywise, howsoever big the name and fame of the competitor. Real stuff, I must say. I believe a lot of drama is staged by blogs/media who do not know about one thing – the power of execution. If one is executing, no competition can beat them..All the best to you guys! Excellent post. Healthy, principled competition makes us better. “Competitors” can become partners. We should always be looking at the “ecosystem” of our respective industry and see where we can be moving to be successful. Innovate, innovate, innovate! Otherwise, close down! I am impressed with the way ZOHO has operated in a fiercely competitive space against the ruthless software behemoths. This article does provide a glimpse of some of the qualities and a clear understanding of the environment that are spearheading the growth and innovation at ZOHO. It’s indeed encouraging to hear of a small player making great strides against the competition who live with the arrogance of ruling the web or our operating systems. I have recently started to use my zoho account as the backup of all the emails I receive across my various email accounts. The point is that I am confident that my emails will be secured in my zoho account. The internet is full of real stories of people who lost their email accounts without any notification or anything from google. I just can’t afford to risk that. I am sure the Office suit (MS) will work better if you pay for it. I also have a feeling that Microsoft is trying to add features like webEx (slideshare?) to their online powerpoint (social networking to others like onenote aka wave? ).Do you think online software (like yours) will always work better considering the fact that they do not have tie-ins with desktop software?More innovation = Excitement for web developers like me. Hang on and enjoy the ride. You say that “For starters, we are the easiest company for partners, large and small, to work with and many times part of the value we bring to some other prospective companies is exactly that we are not Microsoft nor Google.”But my company is a Google Apps provider and would like to start offering Zoho apps (more applications and better features in many areas) and it has been difficult to get an answer from Zoho about a partnership.Regarding Microsoft or Google, just go ahead and don’t fear competition! Zoho is an excellent product. That being said I do beleive you will have a tough time converting prospective customers now that microsoft is having an online offering. But I agree that innovation is the key and though I dont think that Zoho will be able to compete in creation editting of standard documents, I do believe that Zoho can offer specialized targetted offerings which can be leveraged by consumers and corporations alike. Keep Innovating. Your perspective on the nature of the competitive process and your perception of it as an ally rather than an adversary is one of the many reasons Zoho is succeeding so well and continuing to gain market share.I further believe your focus on understanding what your customers want, and how they want to do things, as opposed to a top-down, “We decide what you want, and how you should and shouldn’t do things” is another important element in your formula for success. I don’t think I am alone in feeling that the big players like Google and Microsoft have abandoned any concern for what their users want and need, which is why I have abandoned them in favor of Zoho. I could give many, many examples of the kind of disdain and unapproachable posture adopted by these companies, but I think we all know what they are. When was the last time you could bring up a problem or make a feature request with Microsoft or Google and actually have a human being with a face respond – and within 24 hrs at that?I feel as though Zoho cares about, and is really there to serve its user base, rather than merely using them in the pursuit of its profits. (Not that I see Zoho as a public service – I want to see it flourish financially, as it deserves to. )Glad the news of your demise has proven to be premature. I’m betting on Zoho to continue to successfully meet its competitive challenges and thrive – both today, and tomorrow. IMHO, Zoho hasn’t much to worry about. Office web apps provide a much needed solution for enterprise companies wanting to go web within their borders because of easier integration across apps whilst still falling back on the client app for the heavy work. Going web outside of borders is a different approach entirely and needs a web app designed for the web from the ground up rather than as a compromise.